So, it seems that my two most recent voice mail messages by satellite phone on the ice sheet did not come through to Jason... But in short: we are all fine & happy. Liam, Babis, Mark and I are happy because we are back in the relative luxury in Kangerlussuaq (where there are showers). Mike and Horst are happy because they finally saw us leave, I can only assume. To briefly recap the past few days: we got out firn cores 3, 4 and 5 (with some interesting discoveries strongly supporting a change in the melt over the past decades), did a long stretch of radar measurements in the - if you ask me - most interesting part of the ice sheet (not high, not low), installed firn compaction devices, etc, etc, and in between all this packed up camp at KAN_U and put it up again at the former US radar station Dye-2. Lots of good data gathered. Field chiefs Horst and Mike seemed pleased. The four of us (Babis, Mark, Liam, me) got flown back to Kangerlussuaq today on board a giant Hercules plane, together with a lot of no-longer-needed science gear. Yesterday, fresh blood arrived in the form of Uni of Colorado students Karen and Alex. After what must have been a shock to their systems - many hours of sleepless flight to Greenland and pretty much continuing to the ice sheet right away - they quickly got the hang of ice sheet camp life. 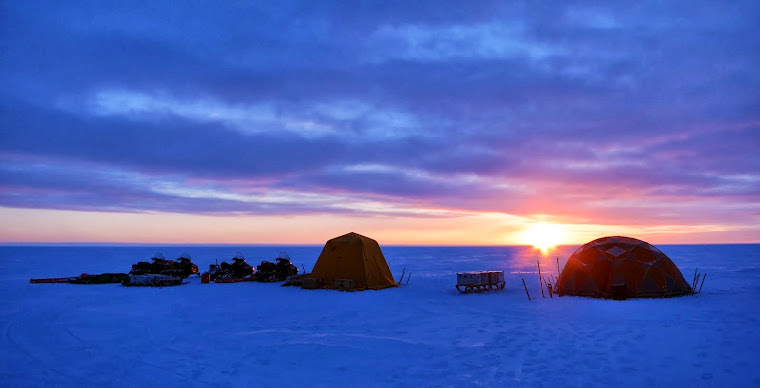 Weather over the past weeks was a lot colder than I experienced on previous occasions, with the coldest nights getting close to -40 C. At this temperature staying warm at night requires 3 layers of clothing, a very warm sleeping bag, two mattresses, and a warm (boiling) water bottle. And then there was the storm... Impressive doesn't quite cover it. Not very cold, but extreme wind chill and only a few meters visibility due to snow being blown around. Walking over to the pee stick, 10 meters from the dome tent where we eat and sit and wait for bad weather to pass, can be very dangerous when you lose sight of the big orange thing going just half of the distance (that's why we have marker poles). You cool down a lot in a minute outside and need to get out of the wind before frost bites. On the ice we learned that during our scientific expedition a UK expedition traversing the ice sheet got into big trouble, not even that far away from us on the Greenland scale, resulting in the death of an expedition member. Scary stuff. Reality sinks in even more when you learn such news. Not that we were worried for ourselves, with double back-ups of everything, but it did get quiet in the camp for a while. Lots of pictures and a description of our last night on the ice coming up soon, involving the exploration of the spooky abandoned radar station Dye-2. We'll also keep blogging about the remaining four friends on the ice, driving their snow mobiles to higher and higher elevations... In the mean time the rest of us will have a warm, comfortable night, and perhaps a few beers before then (which is something you have to do without when temperatures are way below freezing). Thanks for the update. I'm hoping these next 3 weeks go by fast!